For anyone cosplaying the Twelfth Doctor from Series 9, the coat is everything. Pop culture merchandise retailer AbbyShot is bringing back the popular Series 9 coat with the red lining but only if enough people are interested! This may be your last chance. AbbyShot is known for their quality cosplay replicas. In order to create this improved second run of the popular coat as seen worn by Peter Capaldi’s Doctor, AbbyShot is asking that at least 100 people pre-order the garment for the retail price of $274.99 USD. “This product will only be produced if at least 100 units are supported by August 22, 2018 23:59”, according to the product page. Currently they are less than half way to their goal and time is running out. Once you place your pre-order your money will be kept safely in our TARDIS until Aug 22nd. If we sell 100 coatsthe project will be going ahead and production will commence! Production, inspection, & shipping will take approximately 6 months. Some of the improvements made to this second run of the coat are that the inner lining will be placed further from the edge of the coat, shorter sleeves and the hem will be lengthened to be truer to the original design of the coat from the television program. AbbyShot is officially licensed to produce and sell Doctor Who merchandise. However, due to the licensing restrictions they are only able to ship this product to the following countries: Canada, U.S.A., U.K., Ireland, Australia, New Zealand, Africa, Middle East, and continental Europe. Keep up with the latest fashions across time and space by donning this well-crafted, perfectly tailored Twelfth Doctor’s Coat. It’s exquisitely replicated from the one worn by the adrenaline junkie himself, played by Peter Capaldi! If they don’t notice your inconspicuous TARDIS landing, they’ll definitely spot the dashing Doctor stepping out of it! 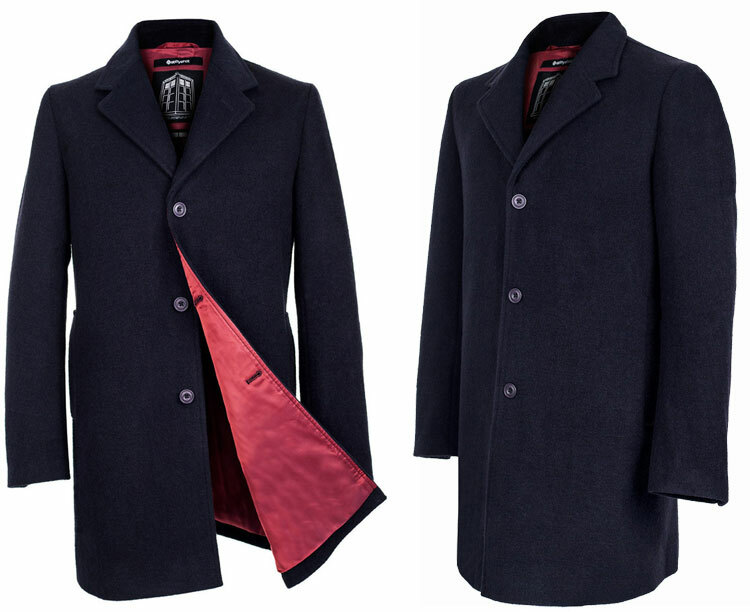 It comes in a deep navy blue wool with fierce red lining and navy buttons. The back vent and soft-to-the-touch fabric might not protect against Silurians, Cybermen or a rip in the timestream, but you’ll sure feel good putting it on every morning! It’s fitted too — meaning it won’t slip off and get lost, unlike your sonic screwdriver. Turn heads on Gallifrey, Earth and everywhere (and everywhen) by snagging this stylish, officially licensed Twelfth Doctor’s Coat today! AbbyShot is also said to be developing some products for the Thirteenth Doctor that will be released soon. However, don’t expect to see those products before the premiere of series 11. In fact it very well may not be until after Christmas. We were told that AbbyShot will wait until after the premiere to get a better idea of what product options they’ll have available, adding “The coat is definitely at the top of our list”. We will be sure to keep you updated as more information comes available.